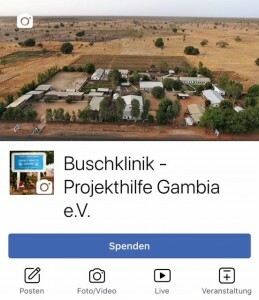 Donations - Projekthilfe Gambia e.V. Every little bit helps the people in Jahaly on their way to a better future. Help us to help. Whether 10 Euros or 10,000 Euros – every donation is an important contribution and a basis for our work in Jahaly Health Centre, Jahaly/Madina Kindergarten and our other projects in The Gambia. We guarantee full transparency in the use of donated funds for Project Aid The Gambia. Your donations reach their destination with minimal deduction. Our donors have the certainty that their donations do not go into the artificially inflated bureaucracy. We promise: from each singe Euro donated some 97-98 cents go directly into our projects. For years, our spending on advertising and administrative costs are around one up to around 2.5 percent of our revenue. 2017 it was 2.48 % only – a rate which we are proud of. The letter from our accountant concerning our advertising and administrative expenses in 2017 can be found | here |. (German only). You can support Project Aid the Gambia with a one-off or regular donation. Become a sponsor for one of the up to 450 places in our Kindergarten with pre-school. Please send your donation to the bank accounts below or use the forms for donations and sponsorships at the bottom of this page. I want to take on a project-sponsorship for a preschool child until revoked for a basic monthly amount of 15 €. I want to support the work of Project Aid The Gambia permanently and for min. € 10 per month to sponsor the organization until further notice. I want to support the work of Project Aid The Gambia through a donation. I need a donation receipt for submission to the fiscal authorities, which will be sent to me at the beginning of the following year after my donation. Please debit the above amount to my account. § 355 BGB (German Civil Law) – Withdrawal at received contract – You will be given a statutory right of withdrawal under this provision, so that you are no longer bound by your agreement, if it is revoked in due time. You can withdraw without justification. The withdrawal has to be in written form, in writing, and has to be sent to Project Aid The Gambia within two weeks. To meet the deadline it is sufficient, to document the fact of sending.